Let’s talk about your holiday carb needs. Because we all know that some of the absolute best thanksgiving (and christmas!) 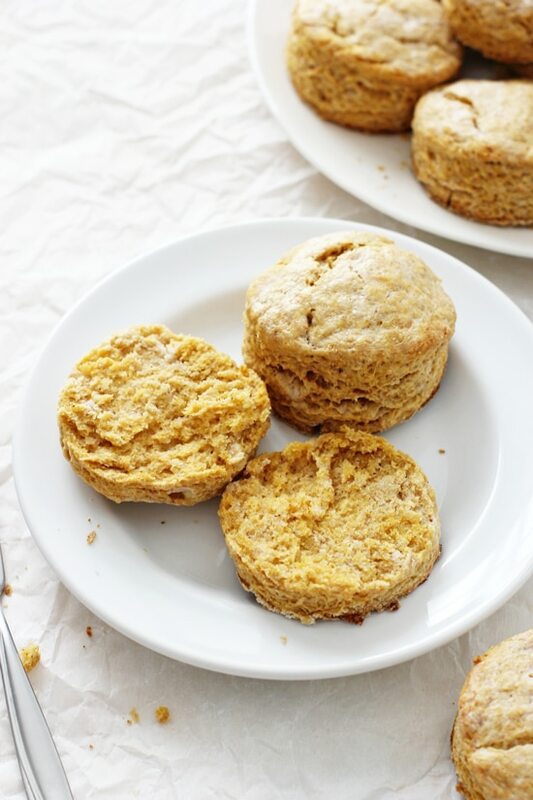 side dishes include things like mashed potatoes, stuffing, fluffy rolls and now … these dreamy vegan sweet potato biscuits! Soft and tender with a touch of crispness on the outside, I’m here to tell you that these dairy free biscuits are darn good. Now. Let’s talk about the flavor. 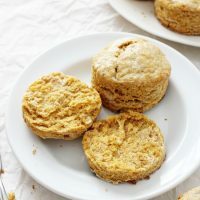 These are definitely savory biscuits that have just a hint of warmth from spices like cinnamon, nutmeg and cloves. The spices are very much a faint background flavor and are more there to compliment and accent the sweet potato. Plus, they’re easy to make, simple and fairly quick to pull together … giving you yet another reason to make them this holiday season! And I mean, who can resist a fluffy, tender biscuit??? Not I folks, not I. 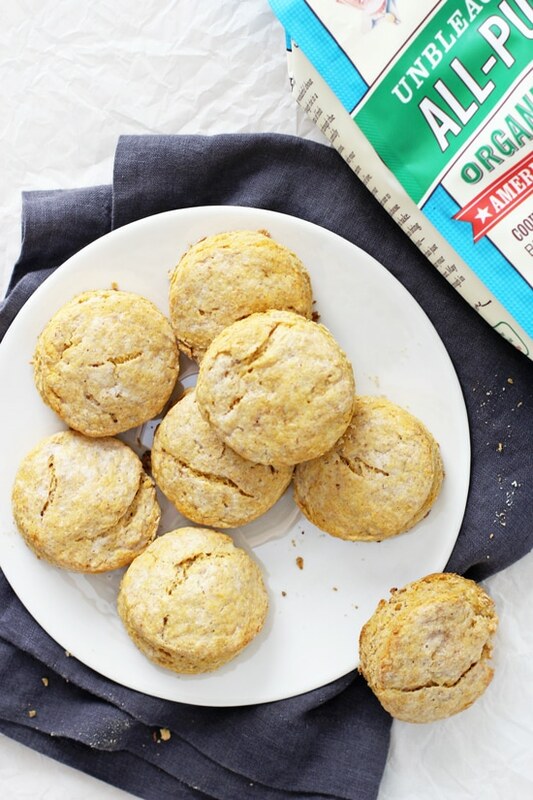 Key Ingredients In These Delightful Vegan Biscuits! Sweet potato puree // Which helps create the most perfectly soft biscuits around. Now, you can absolutely use either homemade or store-bought puree for this recipe. Personally, I tend to use store-bought puree when baking because it’s super convenient. You can find the store-bought kind in cans usually near either the canned veggies or pumpkin puree. Coconut oil // Which behaves remarkably similar to butter when in its solid state. We’ll cut the coconut oil into the flour mixture just like we would with traditional butter biscuits! Coconut milk // Rich and creamy, canned full fat coconut milk is our substitute for traditional heavy cream or buttermilk, and helps create a super tender final product. 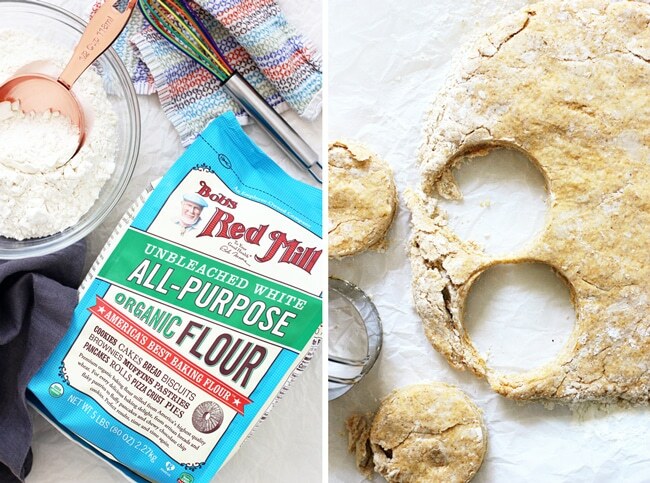 Bob’s Red Mill organic all purpose flour // Which also is essential for creating the perfect biscuit texture. I use Bob’s AP flour in so many of my recipes as it helps keep baked goods perfectly light and airy. Not to mention that the quality and flavor is top notch and it’s unbleached. If you want excellent baked goods, use the best flour you can get your hands on – it absolutely makes a difference in the final product! Please, please, please be sure to chill your sweet potato puree and coconut milk before using. This helps to create biscuits that are fluffy on the inside and slightly crisp on the outside. It’s especially important to chill these two ingredients as we are using coconut oil instead of chilled butter in this recipe. So just do it, okay?! Now, let’s talk about the dough. You don’t want your dough to be too wet – i.e. add just enough coconut milk to get it to come together – it’s okay if it’s a tad bit crumbly. I typically need to add about 2 tablespoons of extra coconut milk, but keep in mind that this may be slightly different for you. Along those lines, don’t overwork the dough, as this will result in tougher and flatter biscuits. So bring it together as best you can, then gently pat into a circle. Next, you’ll cut out rounds from the dough with a biscuit cutter – just press down and cut (no twisting as this will sort of seal off the biscuit edges!). Additionally, try to cut out as many circles as possible from your first two rounds – it’s important to try to limit patting the dough back together too many times. Keep in mind that because we are using coconut oil these biscuits will not turn a deep golden brown like regular biscuits using butter. Instead, they’ll have just a faint golden tinge around the edges. And finally, remember that biscuits are best enjoyed freshly made! However, if you want to make these in advance, here’s my suggestion. Make the dough as directed and place the cut biscuit rounds on a parchment lined baking sheet (DO NOT brush with the extra coconut milk – the tops get sort of funny if you brush these before freezing!). Place the sheet in your freezer until hard, then transfer the biscuits to a freezer safe bag or container. When ready to enjoy, bake at 400ºF for about 18 to 19 minutes (i.e. about 3 to 4 minutes longer than what’s listed down below). If desired, you can brush them with some extra coconut milk right before baking OR just leave plain. Additional Homemade Bread Recipes You Might Enjoy! 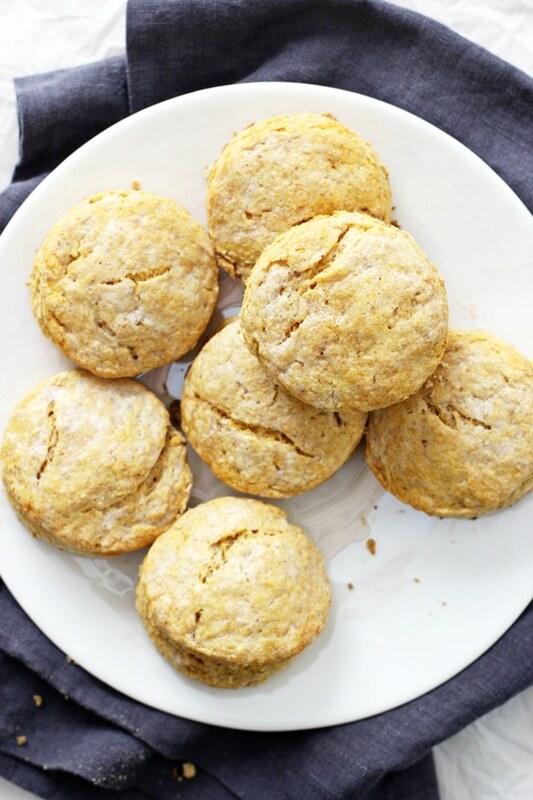 Soft and tender vegan sweet potato biscuits! 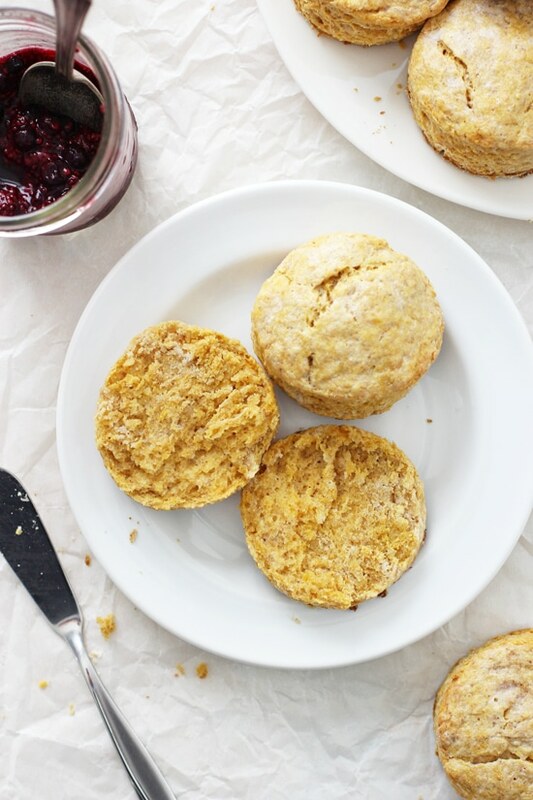 With a slightly crisp exterior, these simple savory biscuits are hard to resist! Made with coconut oil, coconut milk and sweet potato puree! Excellent for thanksgiving or a regular day! Preheat the oven to 400ºF. Line a large baking sheet with parchment paper and set aside. In a large bowl, whisk together both kinds of flour, the baking powder, sugar, salt, nutmeg, ginger, cinnamon and cloves. Add in the coconut oil and use a pastry cutter to cut the oil into the flour, continuing until it resembles even-sized crumbs. In a small bowl, whisk together the sweet potato puree and coconut milk. Add to the large bowl and mix just until the dough comes together (if the dough is too dry, add in additional coconut milk one tablespoon at a time - I usually need to add about 2 tablespoons). Dump the dough onto a well floured surface. With well floured hands, bring the dough together then pat into a circle that is about ¾ to 1 inch thick. Using a 2 to 2 ½ inch biscuit cutter, cut out biscuits from the dough and place on the prepared baking sheet, spacing them about 2 inches apart. Pat together the scraps into another circle and cut out additional biscuits until the dough is used up. Brush the tops of the biscuits with the remaining coconut milk, then bake for about 15 minutes, until puffed and just barely golden. Serve! *You want your canned coconut milk to be fully combined - i.e. not at all separated when using for this recipe. I like to add the contents of a can to a small saucepan and heat on the stove over medium until just combined and no longer separated (no need for it to be warm or hot!). I then let it cool and store in the fridge in an airtight container until chilled. Use what you need for this recipe and save the rest for something else (like smoothies!). This post is sponsored by Bob’s Red Mill. I received compensation + product for writing this post, however all opinions and content are completely my own. As always, thank you for reading and letting me share brands that I truly love!